A new hotfix (KB2171141) is out from Microsoft that resolves an issues with the IE8 search provider when applying the “Prevent Internet Explore Search box from displaying” is enabled (see image below). 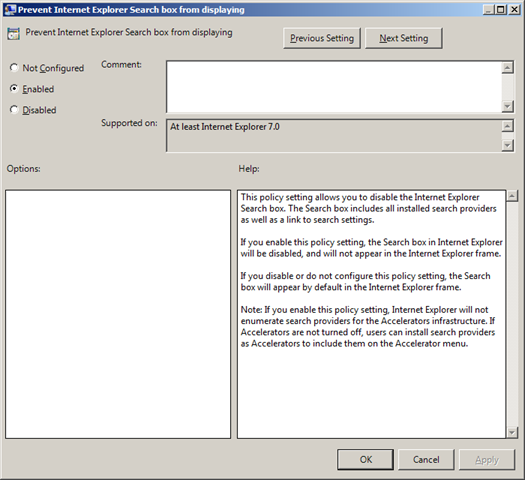 This policy will remove remove the search box from Internet Explorer (see image below). 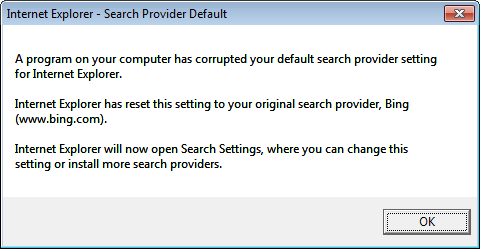 But then when a user logs on to the computer for the first time they are prompted to setup their default IE setting and then they will get this error message (see image below). It also looks like this hotfix is also probably not going to be in Windows 7 Service Pack 1 as it is not listed in the complete list of hotfixes. ← Active Directory and Group Policy… Would you like to know more? This hotfix worked for me. Thank you very much.